I saw the Quick Guide to reading a Chest X-ray over at ScrubNotes, and decided to publish the ortho version: How to read an AP Radiograph of the Pelvis. As with the CXR, it is important to evaluate the AP radiograph of the pelvis using a systematic approach. Here is that approach that I have been taught. There are six lines that one should evaluate when looking at an AP radiograph of the Pelvis. 1. The iliopectineal line to evaluate the anterior column. 2. The ilioischial line to evaluate the posterior column. 3. The dome of the acetabulums. 4. The 'tear drop' to evaluate the anteroinferior portion of the acetabular fossa. 5. The anterior rim of the acetabulum. 6. The posterior rim of the acetabulum. It is also, of course, important to evaluate the rest of the bony structures visible on the radiograph, including the pubic rami, the SI joints, the neck of each femur, the visualized lumbar spine and sacrum, and the pubic symphysis. Fractures in the pelvis can be difficult to visualize and if there is doubt, one can order additional views, including inlet and outlet views to further evaluate for rami fractures. The inlet view will allow for evaluation of the superior rami for fractures and the pelvis for anterior-posterior displacement of the pelvis. Outlet views will allow for evaluation of the inferior rami for fractures and for determination of superior-inferior displacement of the pelvis. Judet views are one additional study that can be ordered to evaluate the acetabulum. These views are shot at a 45 degree angle to the pelvis. The obturator oblique radiograph will allow for evaluation of the anterior column and the posterior wall of the acetabulum. The iliac oblique, conversely, will allow for evaluation of the posterior column and the anterior wall of the acetabulum. 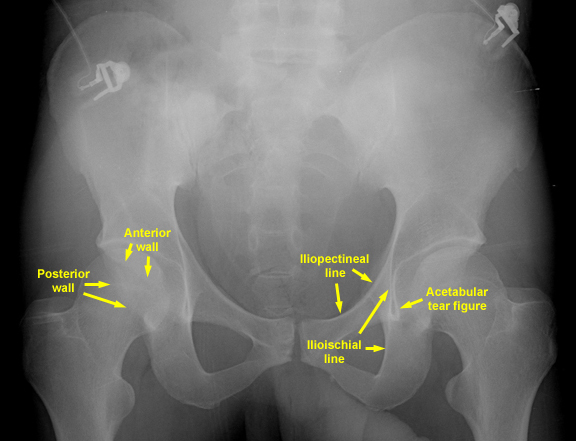 For another take on it, check out Pelvic X-rays by OrthoIntern.